SPDR Gold ETF GLD, $113.77. As I have usually written in this blog, I do not trade with futures, but I follow them daily, because they are the basis of all my analysis. For that reason, I think that the best asset to follow in for stock trading when there are FOMC meetings, like this week, is the Gold /GC. Usually designated as the safe haven asset, together with the Japanese Yen, this week has a decisive test in Wall Street that will determine its behavior in the rest of the year. This Wednesday 26th will be known the FOMC's decision and mainly its guidance and forecast, very important to know the behavior of the dollar in the next Q4, and therefore its antagonist, the gold. A Rate Hike, as expected by almost all analysts, would complicate the price of metal. If you add to this a probably hawkish outlook of the FED, the recovering in its price, which seems to be beginning, would become very unlikely, since it is known that historically gold suffers with rising interest. On the other hand, there is another edge: the Trade War. It will depend a lot on the results of the China-USA agreements (if there are any! ), to see the future behavior of gold and commodities in general. Just look at the following chart to see intimate behavior that has been with the yuan for months, artificially devalued by the Chinese government to cope with the Trade War. A good deal would release the yuan and pull the gold higher. 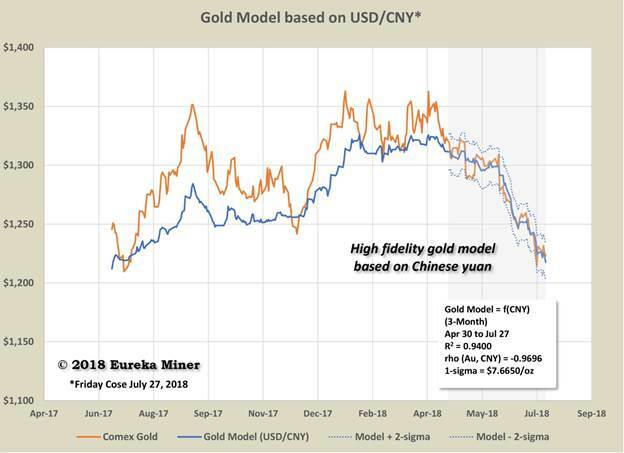 Interesting: close as ever the correlation of prices of Gold and the Chinese Yuan. In my weekly charts I usually plot the price with a EMA13 (exponential average of 13 candles) on it, as a key to determine the future movement of a stock. I observe the next two candles after cross this average, in conjunction with the Impulse System indicator (developed by Alexander Elder) which combines trend with momentum through the MACD. If I have two consecutive candles with green value I have the confidence of a bullish rise, at least for a few weeks, ideal for a swing trade. A later yellow indicator gives me the warning sign of possible turn in the trend. Similar behavior is for a bearish case. Today, the weekly chart of gold shows its evident fall since April, at the beginning of the Trade War, even of a much steeper slope than the rise of the dollar, its usual antagonist. However, a month ago there are already clear signs that this strong fall may be decreasing: the impulse is in yellow for 5 weeks and the MACD, even in negative zone, begins to reach a bull crossover. The lower ADX indicator in 34.02 confirms the strength of this trend. The EMA13 (in black) is my main indicator for weekly candle charts. The breaking of the channel (in yellow) in April coincided with the beginning of the Trade War and from there, the GLD chart comes in strong fall. I usually pay attention to the exact moment of the announcement of the FED to speculate with a fast daytrade based on the news. And I do, as I say, with gold, through the GLD or IAU etf, the higher volume ones, or with the 3X triple speed ones like NUGT and DUST, bullish and bearish respectively, usually of extreme volume in those days, and with 80% of implied volatility. Something less volatile, but with a lot of trading volume is GDX the etf 1X that follows the mining companies. I do not intend to go long in gold in the short term, not even in a swing trade, until see the evolution of the trade war: if the effect of tariffs is felt in the economy, a significant increase could be expected.